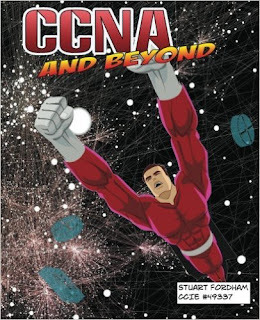 CCNA & Beyond book CCNA CCNA and Beyond: Finally published! It has taken quite some time, but finally the book has been completed, and now published! I started it in October 2015, and finished it last night. So that's six months of hard work completed. The book follows the CCNA Routing and Switching syllabus, and builds a network from the ground up. Each section builds the network up, and, unlike other CCNA books, does not jump from one topic to another, without it having an impact on the network. It is meant to be a holistic view of networking, and show you as a network engineer, how the different parts of the network combine. The book is available to order from Amazon, and I will post the links here when it has got to all of the different Amazon sites. I will be adding more to the website, the next post will be on how to get UNetLab set up for the CCNA and Beyond labs, and this will include an accompanying video. The website will also get an overhaul, with a new design, but that's not essential right this minute. congratulations on the book being released. does this book covers the new v3? I mean all the blueprint topics of the new 200-125? Thanks! No it doesnt as Cisco update to the v3 just after it was published. There will be updates on the website though to bridge the gap. Since you have a kindle version of the book released, would you push out a new update for that book? It certainly would become handy to read from the book and not jump into website to read on whats missing.